I have been thrifting for over a decade looking for lost board game treasures. Here are a list of games I no longer pick up. Some games I believe are not just worth picking up anymore - maybe they are too common, maybe they have little or no value. Here is a short list of games I no longer pick up while thrifting. I just see this game way too often. Its not a bad game but really how many of these do I really need. This entry includes all the varients from Lord of the Rings to the Transformers and back. In the end this is risk and for a game over sixty years old the gaming world has moved on. Again this include all varients and "editions". I enjoyed the game as a kid but even with modern editions tweaking the game the game has had its day. Let it go. 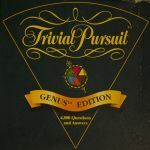 After looking at many trivia games not only trivial pursuit I have found these games age very quickly as events and people outpace the trivia on the cards. I also find they tend to get very repetitive so I leave these on the shelf. I see these cards from time to time. They are usually loose commons with no rules looking forlorn in a clear plastic bag hanging on a hook at the thrift stores. Not worth anything and usually not enough to even make some basic decks for my nephews or nieces. At best they are good card backs for game designers. This is the one that comes to mind. I've seen several of these and won't buy any more after buying the first two.